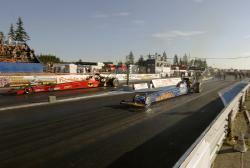 The FIA European Drag Racing Championship tour finished its northern swing through beautiful Scandinavia with the fourth round run at the Gardermoen facility in the forests of Norway. The event was held in hot conditions as the European summer heatwave continued but that did not exactly hinder performances and many great times were recorded during the weekend. 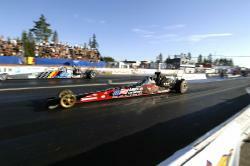 Top Fuel Dragster had four qualifying rounds over Friday and Saturday, some teams struggled whilst others made it look simple. It was the Veidec machine of Håkan Nilsson that led the way in three of the four qualifiers, ending with a pole position of 4.863/304 with Thomas Nataas close behind at 4.943/308, Micke Kågered in third with a 4.962. Lex Joon suffered two flash fires before finally getting a handle on things to end up number four with a 4.986, also sustaining their fair share of bad luck was the Urs Erbacher team, one fireball, one no show and a shut off on the line before recording a clean but early shut off pass of 6.894 that put him on the bump spot. Tommy Möller drew the short straw carding a best of only 8.834 after lifting off two blowers from their studs and unfortunately gaining a DNQ. Round one of Top Fuel saw Erbacher pull out all the stops running a fine 4.747 at a whopping 319.57mph but it was all in vain as the red light in his lane glowed embarrassingly allowing the non too tardy 4.830/300 from Nilsson take the win. Håkan Fällström went up in smoke around the 200 foot mark clicking off to a lowly 6.859/20 as Joon stormed to a 4.762/294 win in his lane. Nataas thrashed out a 4.977/300 as Denmark's Rene Hersland managed a losing 5.774 at 210 mph in their bout and the last pair had new girl Siw Nystad face Kågered, Nystad left first with Micke trailing on fire in the lights but the win light showed in Nystad's lane, a stout 4.967/308 against the slowing 5.233/228. Nilsson tried to catch Joon in the opening pair of round two but hazed the slicks at about three quarter track slowing his good weekend down to a losing 5.024/269 as the Dutchman recorded a 4.849/290 win ticket. Nystad's machine, the former Andy Carter car sounded sick as it started up and was shut off allowing team-mate Nataas an easy 6.514/131 win to set up the final. The MPM Oil-backed machine of Lex Joon made good all the recent woes as he caught and passed the leave of Thomas Nataas in the red Batmobil car as it went up in smoke at half and again at three quarter track. A winning 4.946/290 gave the Joon team their first win of the tour as Nataas limped home with a 6.717/133. No prizes for guessing who led the pack in Top Methanol Dragster - it was the Champion Dave Wilson once again leading the way with a 5.473 at 260 mph, over a tenth ahead of the seven car field. Rob Turner followed with a fine 5.583 and then came Peter Schöfer with a 5.594 leaving the rest to scrabble for the remaining places. Krister Johansson and team had been chasing a misfire all weekend in the A/Fuel dragster and a better sounding 6.076/252 win gave them optimism for the next round as it beat the 6.514/235 try from Timo Habermann. Newly licensed Swede, Rickard Persson was left in the dust as Rob Turner turned in a 5.674/231 win to the 7.460/185 try. Peter Schöfer once again was battling severe tyre shake but managed a 5.610/258 that beat the smaller machine of local lad Yngve Solberg, 7.496/193. Seeing out the round was a bye of 5.512/258 from Dave Wilson. Into round two and it was back to the drawing board for the unlucky Johansson car as it spluttered up track issuing clouds of unburnt fuel, losing with a 15.360/59 as opponent Wilson pushed to a 5.498/258 win. Turner ran into problems in his duel with Schöfer slowing to a losing 8.790/14 as Schöfer shook just off the line getting almost sideways nearing half track before recovering well to record the win with a 5.644/257. The final was another notch for the American Car Imports/PlayStation 2 dragster of Dave Wilson his 5.495 coupled with a 257 mph overpowered the holeshot 5.607/258 from the 'Bavarian Thunder' machine of Peter Schöfer. Top Methanol Funny Car qualifying was led by Leif Andréasson with a 5.820/248 closely followed by fellow Swede Ulf Leanders at 5.849/242 and Denmark's Dan Larsen at 5.892/244, all well ahead of the six car field. The opening round gave some drama as after a stunning 5.799/245 Andréasson's Dodge Stratus broke part of the rear chassis that held the chutes depositing them in a bundle on track as he careered on just avoiding the catch net that would have further damaged the vehicle. Opponent Arvid Grødem slowed to a losing 6.187/127. After the delay to recover Andréasson's machine Leanders carded a fine 5.834/244 to down the troubled 6.622/44 from Kjell Sjöblom and Larsen ran a winning 5.976/243 to oust the 6.046/239 from Finland's Jarmo Kuutniemi. A repaired Andréasson machine got the rounds bye and did not hold back disproving his own theory that he was “driving like an old woman” with a 5.874/241 to make the final. Joining him in the money run was Leanders whose holeshot leave got him the close win against Larsen, 5.809/244 win to the 5.913/241 lose. The final became a pedalling duel as first Ulf Leanders' IronCAD Firebird got loose then Leif Andréasson's Kamasa Tools/Swedish Armed Forces car at half track who then shut off to a losing 6.895/40 as Leanders powered by to win with a great 5.784/247. It was an impressive eight car field in Pro Stock that was led by Michael Malmgren's 6.907/200.62 and followed by Jimmy Ålund 6.943, Magnus Hansson 6.976 and last in the sixes was Eero Knihtilä at 6.995. 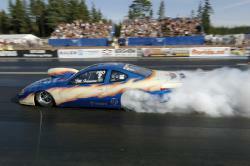 Knihtilä kicked off round one with a 7.008/199 win over the 7.010/198 from Tommy Leindahl's Camaro. Ålund seemed to struggle as his 7.383/196 tried to catch the up-setter Peter Dahlin and his winning 7.190/192 in the second pairing. Kenneth Söderström's Grand Am powered to a great 6.996/197 but was beaten at both ends of the track with the holeshot win of 6.979/197 from Magnus Hansson. Malmgren gave no ground against Jan Palmqvist in the Volvo C70 a 6.908/199 quickly despatched the Volvo's game 7.35/187. The six-second timing of Malmgren's 6.987/199 was all to no avail as Knihtila's better reaction time won the race with a 7.028/198 in round two. The giant killer Dahlin was quickly dealt out in the next pairing as the red bulb in his lane put and end to his chances running an acknowledged 8.551/118 and watching as Hansson went through with a winning 7.040/197. The final was a real close call as Magnus Hansson's Pontiac Grand Am left first with Eero Knihtilä's Chevy Cavalier in hot pursuit but it was Hansson who stayed ahead to reap the reward with a 7.018/197 to the losing 7.073/197. Pro Modified provided all the drama anyone could take with record setting paces changing places in each round but it was Andy Robinson that ended up on top of the pile with a great 6.266/228.266 the only driver in the 6.2s! Micke Gullqvist was in second spot with a 6.303 and Urban Johansson in third on a 6.305. Another five racers made it into the 6.3s with the remainder of the sixteen stretching down to Seppo Saapola on the bump at 6.759. Sunday's Pro opener was the Pro Mod category which was immediately stopped after the first pair as Jan Arve Nygård red lit and Mikael Lindahl's Chevy Bel Air got crossed up in his own liquid and punched the Armco around the same spot as he hit earlier in the year to the cry of "Oy Oy Oy" from the commentary box. It took an hour to replace the bent guardrail after which Roger Johansson of the better of Bruno Bader, 6.69/215 win to the better but losing 6.584/216. Mats Eriksson gained the perfect reaction time and coupled it with a 6.551/223 win as Jörgen Karlsson failed to catch up losing with a quicker and faster 6.501/217. The bout between Micke Gullqvist and Sverre Kahrs took just 6.308 seconds at 227mph as Gullqvist powered home leaving the early 'Vette to come second with a 6.516/217. Marc Meihuizen's '37 Coupe ran a winning 6.418/219 as Marko Lantto's 6.56/220 failed to pass. 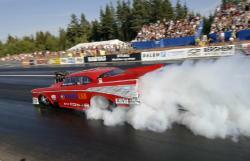 Niclas Andersson in the Chevy Coupe red lit and slowed accordingly allowing Urban Johansson to zoom to a 6.256/228 win. The holeshot from Norbert Kuno was well executed and he held on to the lead for a 6.48/223 win over Gordon Appleton's 6.479/220 try. Last in the first round pairings was the race between Andy Robinson and Seppo Saapola's Chrysler, Robinson took the lead and paired it with a 6.291/228 win as Saapola ran a trying 6.7/89. Another great holeshot from Robinson with a 6.283/227 gave him another round win whilst Nygard allowed back in the first or worst rule slowed to a 7.837/131. A rare red light appeared in Roger Johansson's lane and he slowed after seeing the win light in Erikssons lane lit up with figures of 6.431/223. It was the 6.301/227 in Gullqvist's lane that produced the win as Meihuizen could only muster a losing 6.461/219 in his. Urban Johansson managed to catch and pass the quicker leave of Kuno's machine and his lights showed a winning 6.36/224 to the 6.479/221 lose to end round two. A double red light opened the semis as Eriksson's 'Green Goblin' Crown Victoria pulled a blatant 0.046 disturbing Robinson into a red light as well but it was Eriksson that slowed obviously aware of his error as Robinson was on and off the throttle and getting close to the centre line but taking the win with a 7.042/208. Gullqvist got the better light and with his 6.282/223 got the win in his bout with Urban Johansson's chasing 6.23/228 try. The final featured the two best running machines of the class as Andy Robinson's '53 Studebaker Commander faced the '57 Chevy Bel Air of Micke Gullqvist. Robinson's car leapt first only to light up the cherry but running a best of 6.246/229.43 giving the race and trophy to Gullqvist's 6.297/228. 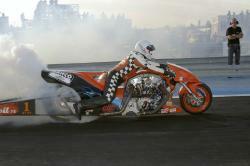 The thumping sound of the mighty Supertwin Bikes were on hand to entertain the crowd and it was led unsurprisingly by Ronny Aasen on a 6.652/210 stormer. He was followed by the ever strengthening Lorenz Stäuble on a 6.764/206 pass then Svein Gottenberg at three with a 7.159/201. Hanging onto the bump spot in the eight bike field was Hans Olav Olstad on an 8.010/136. Round one kicked off with Olstad getting a thorough thrashing by Aasen in a 6.948/180 win to the below par 9.407/102 try. Fredrik Solheim then carded a winning 7.603/179 as Vidar Ravnsborg came back in as alternate for a broken Alm Trond but got no further. A bit a wobble up track did not deter Stäuble as he powered to a fine 6.827/205 over the losing 7.402/185 by Hans Christian Nilsen. Ending the opening stanza was the win from Svein Gottenberg with a 7.139/198 over the losing 7.453/147 from Svein Olav Rolfstad. Solheim’s game but slowing 7.523/97 was no match for the might of Aasen again slowing 6.993/163 to place him in the final round. All of Stäuble’s good luck went out the window in the next pairing when he beat himself with a red light, wasting a 6.895/207 and allowing a grateful Gottenberg through with a slowed up 10.215/83. The Champion Ronny Aasen could have been said to have just held on for the win, or he had got a handle on things – but no – just one handle as in handlebar! In what was a battle of nerves Aasen held on to the forks as one handlebar broke mid pass, he did win though with a 7.241/148 as Svein Gottenberg slowed to a losing 13.404/100. Sportsman class results were not available at the time of writing.